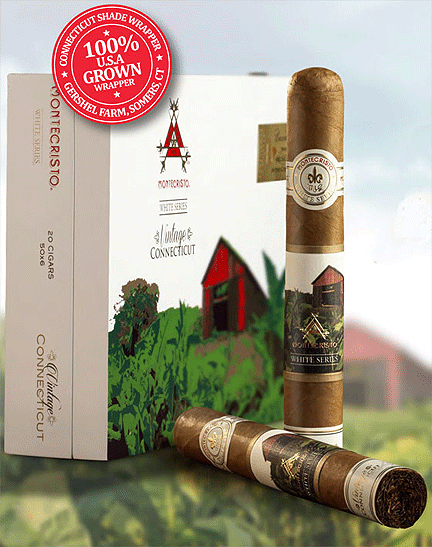 Montecristo White Vintage Connecticut | Chicago's Pipe, Cigar & Tobacco Store | Iwan Ries & Co.
Montecristo is one of the most storied and popular cigar brands in the world. Crafted with meticulous attention to detail and using only the finest tobaccos, Montecristo cigars are always satisfying and always expertly constructed. Montecristo White Vintage is the follow-up to the heralded Montecristo White series and offers a refined and smooth experience. Coming dressed in a US grown Connecticut shade wrapper from 2008, a Nicaraguan binder and Dominican, Nicaraguan, and Peruvian long-fillers complete this easygoing blend. Mild to medium-bodied, this stick expresses notes of hazelnut, vanilla, coffee, and spice to set the table for a mellow and smooth blend. Montecristo White Vintage will please all palates and is a great choice to enjoy any time of day.